Resonates with the High Heart Chakra: The high heart chakra is located between the throat chakra and the heart chakra, sitting at the thymus. It represents universal love, compassion, and acceptance. This chakra when open and balanced will create a love and aspiration for the Divine, a love for the world that you live in, and those around you, and will open you up to higher spiritual levels. It also has the ability to connect our dreams and desires into the waking reality. The big significance here lies in the fact that the thymus was where Marcel Vogel recommended we enter the body energetically for healing. This area is thought to be the bridge between our soul body, and our physical body. Resonates with the Seventh Ray: There are seven spiritual rays that represent a unique frequency and quality of the Divine. 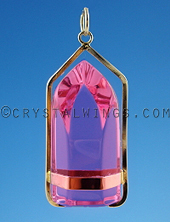 Ruby Lavender Quartz vibrates with the Violet Flame, or the 7th Ray. This ray works through the heart and therapeutically offers up the qualities of love, forgiveness, compassion, mercy, freedom, and transmutation. The Ascended Master Saint Germain is the lord of the 7th ray. He said, quoted in The Voice of I AM in January of 1941, "The use of the violet consuming flame is more valuable to you and to all mankind than all the wealth, all the gold and all the jewels of this planet." Brings in the Divine Feminine: The yin energy is not reserved for just women. It represents the more passive, receptive, intuitive part of our being. 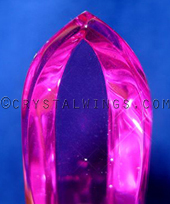 This quality brings forth an energy of inspiration, a catalyst for change, and creating a deeper and more passion-induced desire for your dreams to come to fruition. The divine feminine also carries with her the archetype of the ‘healer,' resonating with transpersonal and harmonious love for everyone and all beings. She is the domain of spirituality, mystical experience, and the sixth sense. Trinity of Color: Ruby Lavender Quartz carries within it three different rays of color: Red - representing taking action, manifesting in the physical world, passion, change, and courage. 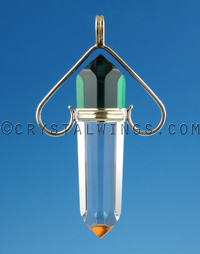 This ray awakens and stimulates the energy body. Pink - representing unconditional love, the purity of the heart, deep understanding, and empathy. This ray gently guides toxicity (that our energy body can sometimes be addicted to) out with undaunted encouragement. Violet - representing compassion, union with the source, and transformation. 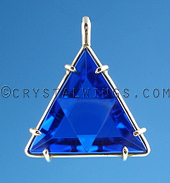 This ray invokes magical abilities, and balances power and love. To provide information to the user with respect to the context of love; specifically to assist one in understanding universal-love, spiritual-love, unconditional-love, and emotional-love. It has also been helpful in emotional/love relationships to actualize unconditional-love. To assist in the willingness to experience “the new” in ones world, and be open to new adventures, new experiences, and new actions without preconceived notion or judgmental-ness. To assist in the expansion of the intellect such that the user is more prone to be in the “learning-mode” (which is sometimes difficult for those who are distracted by other worldly affairs)."